Approximately 7,000 students, faculty and staff at FIU’s Biscayne Bay Campus share one access road with more than 3,000 public school students and teachers, whose schools – Alonzo and Tracy Mourning High School and David Lawrence Jr. K-8 Center – are positioned along NE 151 Street, the only access road to the campus. The situation is particularly precarious during drop-off and pick-up times when school buses and parents in private vehicles are in the area. In addition, the FIU campus is home to MAST@FIU, a public high school. FIU has been calling attention to the access road issue since 2011 by engaging Miami-Dade County and North Miami elected officials, as well as School Board members and Superintendent of Miami-Dade County Public Schools Alberto M. Carvalho, who supports the reopening of the road. The university is pleased to be working with state legislators to reopen the road, creating a second access point to our Biscayne Bay Campus in North Miami, through NE 135 Street. In the past, NE 135th Street was an access point to campus. For years it has been closed to vehicular traffic and used as a walking and bike path by local residents. Many of the students, faculty and staff who study and work in the area are North Miami residents themselves. The number of North Miami residents enrolled at FIU has grown by 33 percent since 2009 and receive approximately $10 million in financial aid and scholarships. A second access road is imperative to ensure safety and prompt evacuation of students, faculty and staff in the event of an emergency, especially in light of residential and commercial growth near the existing access road. Equally important: The current road only offers one access point for first responders. Opening an additional entry and exit point could prevent a real tragedy during a fire, bomb threat, active shooter event or other emergency at any of the campuses in the area. FIU needs the community’s support to maintain a safe learning environment for students of all ages. Shame on my Alma mater, Florida International University, for using fear after the Parkland tragedy to ask State Legislators to open NE 135 Street to their north campus. I’m told they invoked the tragedy in lobbying legislators to give them a second access road through our existing, thriving Arch Creek East Environmental Preserve. Their desire to open the road long predates Parkland. Instead of working with the city of North Miami, which owns the Preserve, they have convinced a North Florida representative, Rep. Brad Drake, to introduce language detrimental to our neighborhoods. They knew our local delegation would never support such an effort. In the dark of night, without due process, they are trying to steal land and undermine home rule. Shame on you, FIU. Shame on your board of Trustees. Shame on your president. North Miamians will stand together to protect our environment and preserve our quality of life. I implore all North Miami residents to today contact as many House and Senate representatives as possible. We won’t stand for environmental sabotage being cloaked as a public safety issue. It’s disgusting that FIU has used the timing of a school shooting in order to pass this amendment in the middle of the night. There was so much support from legislators that the bill was filed at midnight on Friday and voted on Saturday. The RESIDENTS of 135th street are completely opposed to this, it is a residential area. This assessment of the need to open up the NE 135th st road to FIU is disingenuous. Fiu has been told this road is off limits as it goes directly through a residential, long time established quiet neighborhood. Not only that, this opening goes directly through an established ecological nature preserve. It is not simply a nature path, it is home to endangered species and mangroves. Fiu wants the quickest route to another road. They have 2 other viable options but disregard those two options because they prefere they dont have to pay the development costs. They, instead, want to pass their inconvenience onto North Miami property owners. It is shameful that FIU would use the guise of the Parkland shooting to further their greedy agenda. Shame on FIU. Thee is a one vehicle size bridge path only. There is no existing road for 2 way traffic. You have other road access alternatives but want to destroy the existing environmental nature preserve because it will cost less. This is shameful! As a resident of the city we voted not to have this done. I hope readers take the time to get all the facts including there exists a road that provides acess from FIU right onto 163rd street which is a multi-lane road able to handle the traffic flow in and out of FIU. If this was really for the safety of students and staff, FIU would have already moved on clearing that riad as it is a much safer and faster alternative for traffic and does not require the destruction of an environmental preserve. Plus the road would have been built by now. Also efforts are underway to expand 151st street and open up 143rd street to traffic which will alleviate congestion without endangering the health & safety of the residents and wildlife on 135th street. I was present at the 2011 council meeting where local government officials said no to bulldozing the preserve. Over 2 hours of testimony advocating for keeping 135 st closed to through traffic was heard. Those speaking in defense of the neighborhood included faculty & staff from FIU, local government officials, residents of North Miami, visitors from throughout South Fliorida and environmentalists. Only 2 people thought the road should be opened up. And that was when President Rozenberg promised it would only be a temporary solution. FIU has other road access options, but those are more costly, so they would rather destroy the environmental nature preserve. There is no existing two way road, it is a walking/bike path that only one vehicle would be able to use. They would need to destroy mangroves to widen the existing path for two way vehicle traffic. This is shameful! I am a resident of 135th St North Miami neighborhood and I am directly affected by FIU’s petition to open this residential neighborhood with a 4 highway thereby destroying the Arch Creek East Natural Preserve. I oppose Amendment 814195 to House Bill 1287. It will destroy our nature preserve (one of the few left to middle class, tax paying people in this area in a time when all public beaches and parks are being confiscated by private high end condo and planned communities for their exclusive use), bring copious and DANGEROUS traffic to a family oriented community where children play on the sidewalks, and subverts existing Florida Home Rule powers. Please retract this distasteful & opportunistic amendment/bill as it disrespects the residents of this North Miami community. I live in Arch Creek East in North Miami and I am directly affected by FIU’s petition to open this residential neighborhood with a 4 highway thereby destroying the Arch Creek East Natural Preserve. I oppose Amendment 814195 to House Bill 1287. 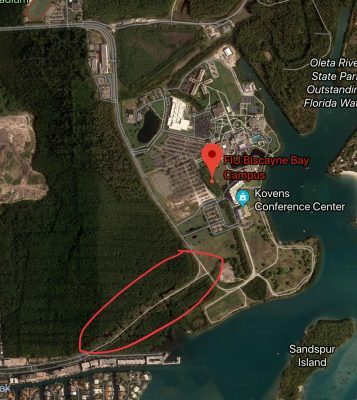 FIU has been trying to send traffic through the Arch Creek nature preserve for many many years. This latest push is taking advantage of a tragedy to ease traffic for the convenience of college students and faculty, at the expense of the nature preserve and the residents of 135th street. This is evidenced by the fact that FIU pushed this amendment as quickly as possible without ANY community engagement. My local politicians were not even made aware of the amendment until after the state house had already voted. This secretive, underhanded, and undemocratic action is shameful. Constant automobile traffic through this beautiful protected urban oasis will destroy the pristine preserve. Shame on you. There are other viable options other than destroying a nature preserve, wildlife, the environment and a tranquil place that so many people enjoy. The residents of North Miami will not stand for this. The city of North Miami addressed this issue in 2011 after another politician tried to get it passed by burying the language in another bill. The 2011 attempt was postured under the guise of “being necessary should there be a natural disaster (i.e., a hurricane). Seven years have passed since the last attempt and the University has not sought any other options. It takes the horrible tragedy in Parkland for them to address the issue of safety again after seven years? There are other options for campus access, obviously more expensive, which is undoubtedly the reason President Rosenberg and the Trustees have chosen to exploit the Parkland tragedy to again open 135th Street. If, after all, it is all about protecting students/human lives….cost should not be an issue. This second, unscrupulous attempt, was again added to legislation by politicians located outside the area who will not suffer at the polls when it’s time for re-election. It’s obvious that ethics don’t rate very high in you or your trustees although I’m sure your institution must offer at least one course on the subject. Scott Galvin, North Miami City Commissioner, would be a great recommendation to teach such a course. How about cutting through your own property to intersect with the new development going up behind the Target and Publix shopping plaza. And I agree with everyone else Shame on you and your administration for using a tragedy for personal gain. Save Arch Creek and the animal habitats that live there. Find another alternative. Maybe go through the trailer park to. They could use a face lift with your money.